Dog flea and tick prevention is much easier when you have the right tools at your disposal. In this article, we’ll review some of the best dog flea and tick collars on the market. With the right product, you can help your dog both kill and repel these annoying and disease-ridden pests for good! Fleas and ticks can wreak havoc on dogs as well as their owners. The warm, soft fur of dogs and other animals make the perfect breeding ground for these troublesome parasites. Fleas can live up to twelve months and spawn millions of eggs in their wake, causing relatively minor health problems like allergies to much more serious conditions. For example, since fleas feed on blood, the blood loss experienced by infested dogs can lead to anemia. Also, fleas sometimes carry tapeworm and can infect their hosts. Like fleas, ticks feed on blood too. However, ticks add an extra level of danger since they can transmit deadly diseases to both you and your pet, such as Lyme disease. In addition, they generally do not create high levels of discomfort like fleas do, so owners may not realize their canines are infected. Fleas multiply rapidly while still attached to dog fur, triggering dogs to scratch and lick themselves intensely, but ticks follow a different method of reproduction. After breeding on their hosts, female ticks detach themselves, then fall to the ground to lay their eggs (thousands of them!) before dying shortly afterward. While fleas prefer milder climates, ticks prefer the cold and they can live up to three years. Ticks are also bigger than fleas and easier to spot. Moreover, it’s recommended that owners thoroughly check for ticks every time their dogs return from the outdoors! Fleas are one of the most common types of pest, responsible for annoying and irritating dogs as well as other animals. Ticks are most active from spring through fall. These blood-sucking parasites prefer to stay close to the head, neck, and ear area of your dog. How Does My Dog Get Fleas and Ticks? Even if your very vigilant, ticks and fleas will find a way of making it into your home and onto your pets. Listed below a few common ways your pup can get these pests. Wild Animals. Wild animals such as squirrels and rodents can carry ticks and fleas and bring them into your yard. It is best not to leave food outside so they do not come uninvited. People. Humans are carriers and can transport them unknowingly. Ticks or fleas can always attach to your pant leg, socks, or shoes. Outdoor Activity. Any time your dog goes for a walk around the block or plays at the local dog park, this is an opportunity for fleas and ticks to attach to your pet. Landscaping. These insects can live in certain plants and vegetation near the house. A way to defend them is by using repellants for yard and perimeter treatment, especially when dealing with an infestation that is already in full swing. What else can I do to protect my dog from ticks and fleas? Prevention is very important. If you know there is a problem, using preventives year-round is best. One form of prevention is using a flea and tick collar. There are other forms of flea and tick prevention such as oral medication that your vet can recommend. Inspect your dog periodically. Also, it is recommended to comb your pet daily with a fine-toothed flea comb such as the Safari Flea Comb which has a double row of teeth. After each use, rinse the comb teeth in hot, soapy water between strokes. In addition, bathing your pup using a good flea and tick shampoo can help as well. There are a variety of products on the market for dog flea and tick prevention, all with their own pros and cons, so it is important to do your research before making your purchase. Aside from our reviews in this article, another great way to determine the best products is by checking out online reviews posted by consumers. A high volume of positive rankings is usually a good indicator of quality products that you can safely use on your own pets to kill and repel fleas, ticks, and other harmful pests. Here’s our pick of some of the top products in the market. As a top-selling product, the highly ranked Bayer Seresto Flea and Tick Collar provide continuous tick and flea control both small and large breed dogs. The Seresto collar has been shown to be safe and highly effective in the treatment and prevention of tick and flea infestations in dogs. A study written in the National Center for Biotechnology Information Journal found that using the collar reduced tick counts by at least 90% and flea counts by at least 95% for a period of at least 7-8 months. 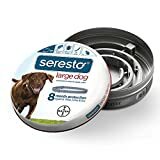 The Seresto collar releases a continuous supply of two active ingredients: imidacloprid and flumethrin for effective 8-months of flea and tick protection. This odorless and non-greasy collar is recommended by veterinarians. If you are looking for the best flea and tick collar for a small dog, you should consider the Soresto small dog collar. It is 15 inches long for small breed dogs that weigh up to 18 pounds. The nice feature about this the Seresto small dog collar is a pre-determined breaking point in the collar. This is a zig zag area on the collar releases to allow your dog to get out of tight spaces. Puppies 7 weeks or older can also wear this collar. When applying this collar to a growing puppy, do not cut too much. Some additional length may be needed as your puppy grows. 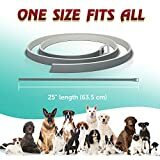 The Soresto collar also comes in a size for large dogs. If needed, any excess length of the collar can be cut. The size of the collar is 27.5 inches for any dog weighing over 18 pounds. With the Scalibor Protector Band for Dogs, your dog gets up to 6 months of protection against fleas and ticks. It contains the active ingredient deltamethrin which is a common insecticide that kills insects on contact. This product has many positive reviews with 50% of consumers giving the collar a 5-star ranking. The collar comes in one size but is adjustable for both small and large dog breeds. Pet owners who prefer to use all-natural dog collars will appreciate this alternative product. 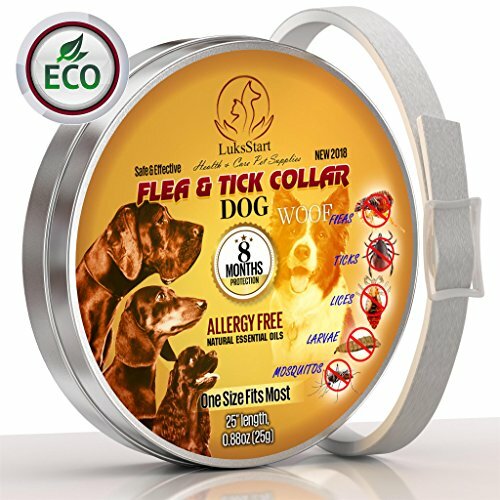 While most dog flea and tick collars contain chemicals, LukassStart bio Pest Control Collar provides multi protection for your pet, thanks to a new composition of natural oils. It will help to drive away and kill fleas, ticks, lice, larvae, and mosquitoes more effectively. The dog collar is 25 inches long, however, it is an adjustable strap. The excess length of the collar can simply be cut off. Of all the products available, we like the Seresto collar best. It is the most effective and reliable alternative to monthly flea and tick topicals available today. The odorless collar is easy to put on your pet and it lasts for 8 months! This dual-action collar repels and kills fleas & ticks by releasing the active ingredients in controlled doses. This means effective long-term flea and tick control without the inconvenience of monthly applications. No mess!